We sell gasoline, highway diesel, off-road diesel, propane and appliances, heating oil, kerosene, biodiesel, lubricants (package oils and greases), solar hot water systems and photovoltaic systems that generate electricity from sunlight. We service residential customers as well as agricultural and commercial customers. We deliver our fuels via short truck and transports. Service, knowledge and progressiveness. We are the local company that has been around for 80+ years and we plan to be here for the next 80. Has Cherry Energy received any national awards or recognition? In the fall of 2002 our company was recognized in BP’s world wide publication “OnSite” for the installation of a 3kW photovoltaic (PV) system, donated to the Kinston-Lenoir Planetarium and Science Museum. This project was also featured in an article published by the North Carolina Sustainable Energy Association in the “Carolina Sun” as well as being featured in several articles in the Kinston Free Press newspaper. In September 2017, Armistead Mauck, Cherry Energy’s Vice-President/Owner, won the Dealer of the Year Award at the North Carolina Propane Gas Association’s (NCPGA) Awards Banquet at the 2017 annual convention in Myrtle Beach, SC. Yes. 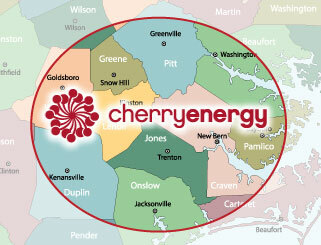 Not only can you pay online, Cherry Energy also offers level payment plans and autopayment options. Is there anything else I should know about Cherry Energy? We are one of the first (if not the first) local Oil and Gas companies in the Southeast to embrace alternative fuels and renewable energy by offering biodiesel, autogas, solar hot water systems and photovoltaic (PV) solar. Both of our owners, as well as the Director of Operations and our Lead Service Department Tech, drive Propane Powered vehicles. Our fleet of Alternative vehicles is growing and also includes an F-750 Propane Powered/Propane Delivery Truck.